This is part of a series which is intended to show that we are not necessarily the architecs of our future. Sometimes, unexpected events shape our history in ways that we cannot imagine. Justinian was the Emperor of the Byzantine Empire since 527 CE. At that time, the Byzantine Empire was the political continuation of the Eastern Roman Empire. The Western Roman Empire had perished as a cause of the Germanic invasions which culminated in the sack of Rome by the Visigoths in 410 CE, the sack of Rome by the Vandals in 455 CE and the establishment of the Ostrogoths as the rulers of the Italian Peninsula since 493 CE. After 476 CE, the Germanic chieftains did not bother naming a new Western Roman Emperor. Justinian had the wish of recovering the western part of the Empire and to unify it under a single ruler, as in the old times. He had the political will and the military might. Under the command of Belisarius, Justinian's armies started to recover the West from the hands of the "barbarians". In 533 and 534, he destroyed the Vandal kingdom of North Africa, occupied Sicily in 535, conquered Rome in 536 and had secured most of the Italian peninsula by 540 when he defeated the Ostrogoths at Ravenna. 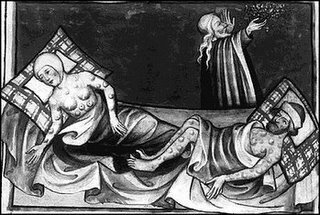 In 541 CE, a disease which, according to the description of the historians of the time (specially Procopius), could have been the bubonic plague, arrived to Constantinople. This condition, decimated the population of Constantinople and most of the Eastern Roman (Byzantine) Empire. Accounts from that time say that the number of dead people in Constantinople alone numbered 5000-16000 per day. By the end of 542, it its believed that 30-40% of the population of the Byzantine territories was dead. This pandemic affected also the Persian Empire, but not the Western side of the Meditarranean Sea. The immediate political consequences of this disaster, were the inability to sustain the newly acquired Italy. The Ostrogoths started to reconquer territories and brought the war into a stalemate. This situation remained unresolved until in 565 CE, the Lombard invasions finally settled the conflict. The weakened Byzantine Empire continued having outbreakes of the plague until the year 600 CE. A not so immediate consequence of these events was the unpreparedness of the Eastern Roman Empire to deal with the Arabic/Muslim invasions that spread from Arabia, through Egypt, North Africa and Spain between 632 and 711 CE. Nature sometimes works in ways we cannot predict.